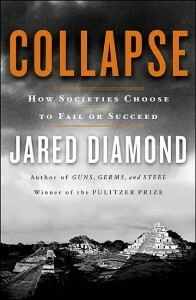 Collapse by Jared Diamond | Blah! 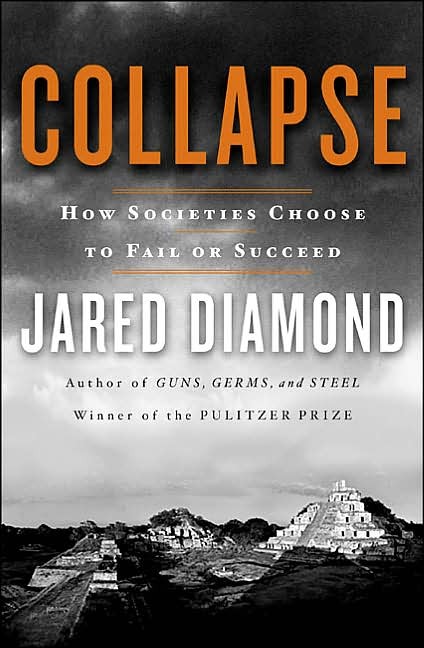 Guns, Germs, and Steel was one of the best books I’ve read, so I was very interested in reading Jared Diamond’s latest book, Collapse. Browsing the reviews at Amazon, they were very mixed, with some finding the book boring, a rush job, or saying nothing new. I guess I can see the last point, if I’d read more about the condition of the world’s environment. But I haven’t, so, for me, it was a real thought-provoking, eye-opening read. And I thought it was far from boring. I don’t know enough about the facts behind Diamond’s claims, so I can’t judge at all the veracity or the bias behind the statistics or claims Diamond makes. Even so, if even half of what he writes represents the real situation, then still the book is of great importance. Not all of these factors contribute to any given society’s collapse, but, according to Diamond, at least one of these is a major contributing factor and for nearly all societies, the first one is often the most important. Diamond tries to demonstrate this by looking at various past and present societies that did fail, including Easter Island, the island of Henderson, the Anasazi, the Maya, Rawanda and Burundi, and the Greenland Norse, and some that overcame their problems and developed a sustainable society, such as New Guinea, Iceland, the Greenland Inuit, and Japan. As Diamond points out, some of the problems that faced some of these societies was essentially random luck, such as the quality of the land they settled. For example, the Greenland that the Norse encountered looked lush, like their native Norway, but the soil was not anywhere near as productive and that led to some of their struggles. The point of all of this is to understand what led to the failure or eventual success of each society so that we can apply the underlying lessons to our modern world. Diamond illustrates those dangers by describing the current state of China, Australia and Montana, showing how ecological damage has affected the environment and, more important, the people and society of each. He concludes that failure is not a given, that societies at some point essentially choose to either fail or succeed. The third point, that they don’t even try to solve a problem that they do know about, is the hardest to understand, but in truth it seems that societies do indeed just fail to act. Whether the choices involved in acting are too difficult, maybe involving abondoning core values or beliefs, or there are conflicting values, such as a profit motive. We are at a point where we will have to make these hard choices to confront problems facing us, choices that many of us will be reluctant to make. Upon reading his arguments, one realizes that the most alarming aspect of all of this is that these are problems today, in a world where the First World uses 32 times more resources per capita than the rest of the world, and the rest of the world is trying to catch up. The rest of the world sees how the First World lives and wants that standard of living. Getting there will mean that they too have a much higher per capita impact on the world, exacerbating all of the problems listed above. For example, if China alone, which is pushing hard to achieve First World standards of living, reaches the same level as the First World, the per capita environmental impact of the world will increase by a factor of 2. This is just if China reaches that level, and many of the other very populus countries are currently poor and working to get to First World standards. All of this made me feel very depressed and pessimistic about the future. These are huge problems that will require huge efforts to fix, require huge changes in how we live. It seems to me that, to reach a sustainable lifestyle, people all around the world will have to compromise. The First World will have to realize that, even if the rest of the world stays poor, the lifestyle we have is unsustainable. We will have to settle for a lifestyle that is less affluent. At the same time, the rest of the world will have to realize that they cannot have the same standard of living the First World currently has, a harsh realization. This means hard choices on both sides, choices that it is not clear to me we will all make. Diamond does end on one cautiously optimistic note. The problems we are facing are caused by us, meaning they can be fixed by us. Some of them will be difficult to fix even if we decide to do everything possible today. But, it can be done if we have the will. Whether we choose to do so will be the big question. There is a lot in this book that I have failed to mention. I highly recommend this book and think it should be a topic of discussion in all classrooms in the country. We all have to acknowledge the problems facing us for there to be any chance that we can address them. That means we have to think beyond how we want to live and consider how we should live. After reading this book, I am concerned about the world my daughter will live in. Hopefully, my generation will begin to act such that her generation has a better chance for a world in which the majority of humanity can live in both a sustainable and reasonably affluent manner. I am just about finished with the book. I, too, highly recommend it. It has been very thought-provoking. It has me wondering about how best to address these issues. Yes, this is an important book. It does have some inaccuracies, so some of the claims need to be taken with a grain of salt, but broadly I think it is a significant historical and contemporary analysis of the vulnerabilities of complex societies to become victims of their own success. BTW, The problems we are facing are caused by us, meaning they can be fixed by us. This is not necessarily true. If I jump off a cliff and am falling onto jagged rocks hundreds of metres below, then I have caused the problem, but it doesn’t mean that I can fix it. Whether or not we can “fix” the problems we have caused remains to be seen.